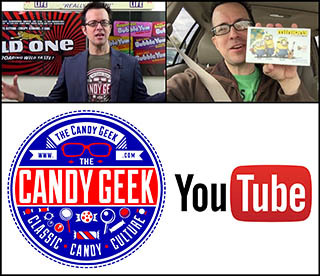 ← Out of Retirement: Big League Chew Cotton Candy and Strawberry are Back! 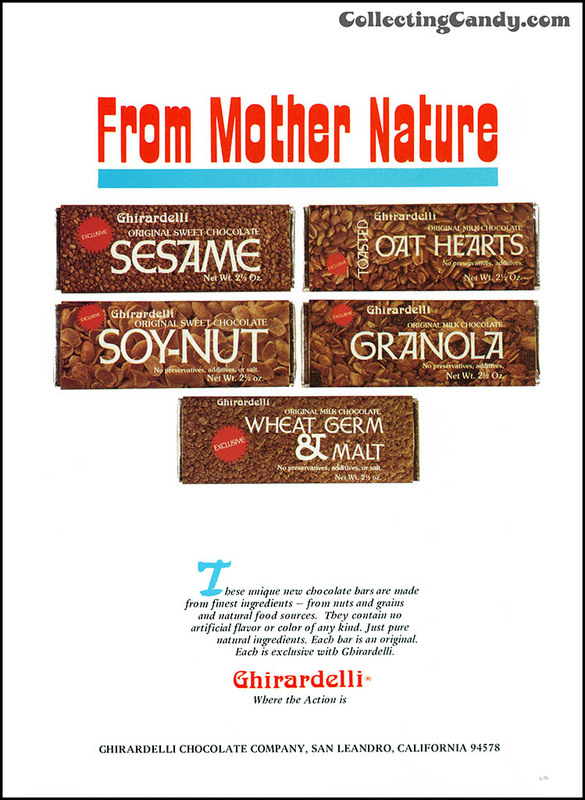 A Groovy 1970’s Flashback: Ghirardelli’s Mother Nature Line! Over the last decade, the business of artisanal and organic chocolate has exploded. With small manufacturers sourcing their own cocoa and adding all sorts of unusual and exotic ingredients to their bars, it’s a great time to be a chocolate lover. Facing a flurry of that kind of confectionery activity, you might be surprised to learn that these types of things were being done at least as far back as forty years ago. 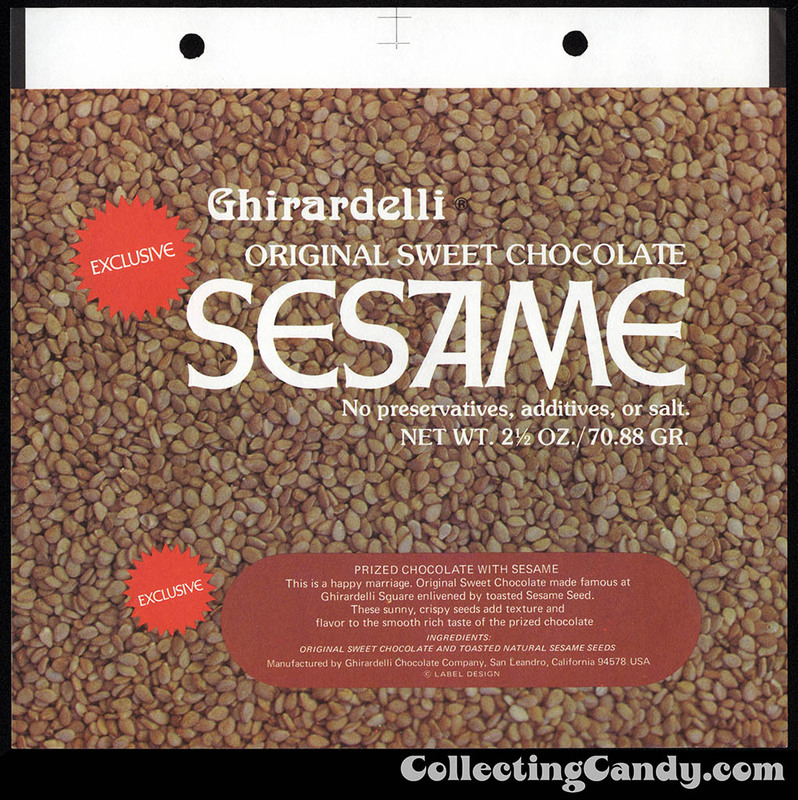 I recently uncovered a remarkable lineup of all-natural chocolate bars featuring ingredients like wheat germ, soy-nut and oathearts – all released by Ghirardelli (pronounced Gear-Are-Deli) and first put on sale way back in 1974! 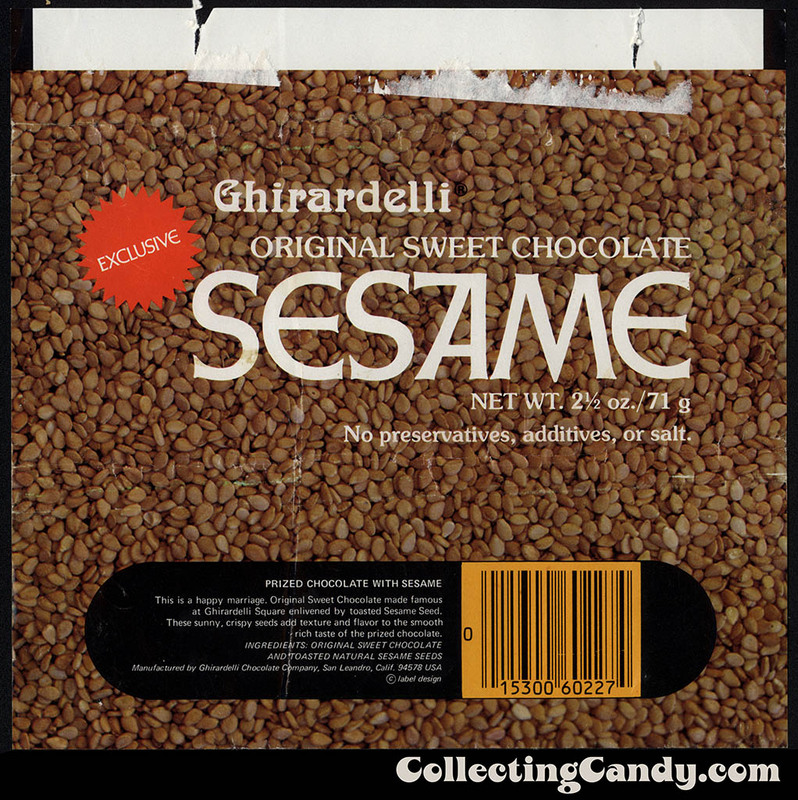 A “Mother Nature” chocolate bar line makes sense coming from the California-based Ghirardelli, especially when you consider that they were a Bay Area company and in 1974 that region had already long been a center for the counter-culture movement. Certainly a part of that movement was to “get back to nature” and to be more holistic. I can imagine that Ghirardelli saw an opportunity to make something unique and different that would appeal to those new tastes. And make something different they did. 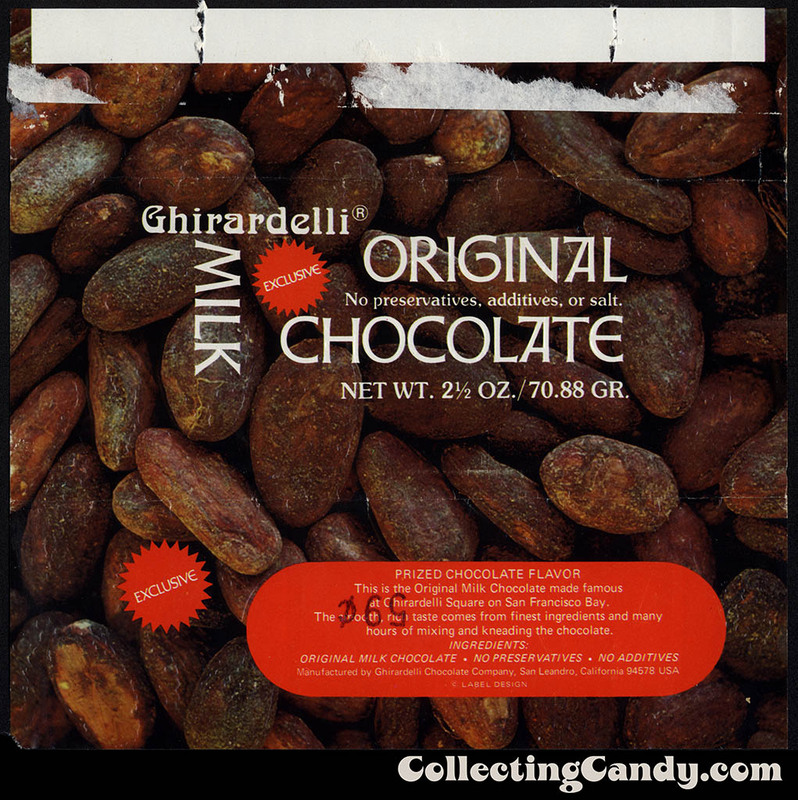 The wrappers for the Ghirardelli Mother Nature line featured a matte finish rather than the more typical glossy, and instead of sporting fanciful brand names these were simply titled by their ingredients in white lettering over a background graphic photo of the ingredients in question. Pretty progressive for 1974, don’t you think? I have a few wrapper examples from Ghirardelli’s Mother Nature line in my collection which I’d like to share here. If you look closely, you’ll see that this Ghirardelli Soy-Nut bar sports a price tag from the Lindberg Nutrition store. Lindberg is a Southern California health food mainstay, having opened its first store in 1949 (and they’re still around today). It’s interesting to note that these bars were being sold through health food stores, which probably isn’t that surprising, but it’s great to see direct evidence of it through that decades-old price tag. Groovy stuff! Now I just need to find a Granola and an Oat Hearts wrapper to complete my collection! It’s neat to consider that these kinds of products were being devised and sold four decades ago and that they managed to stick around for a while, too. Ghirardelli were way ahead of their time with these bars. Reading about Ghirardelli, I’ve learned that they have a long history of doing new things and breaking uncharted ground, so I suppose you could say that the Mother Nature line was par for their unusually-navigated course. Whatever the case, I think it’s pretty cool. 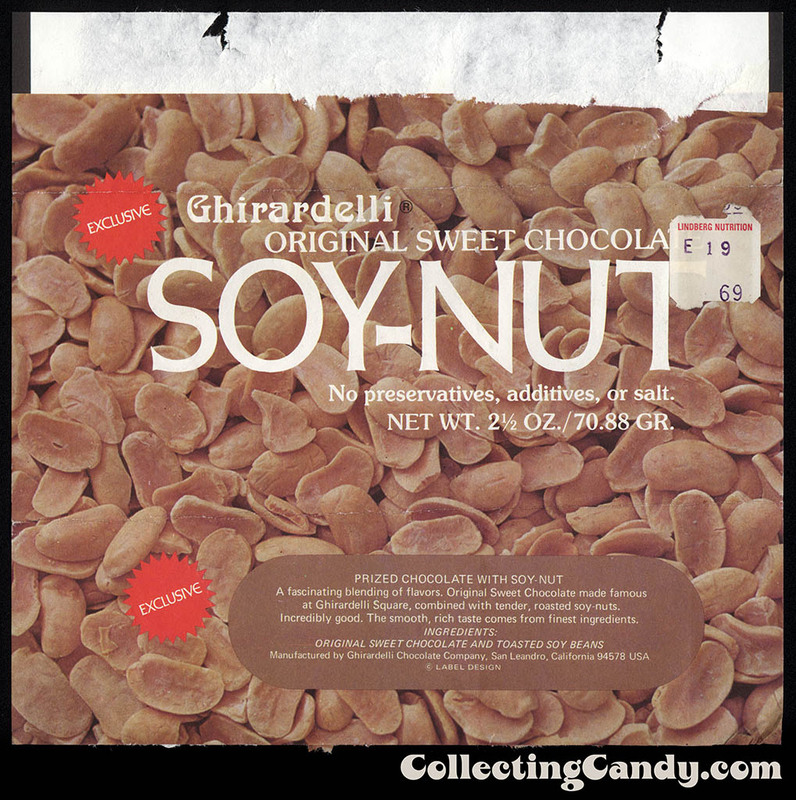 And that’s everything I’ve got to share on today’s 1970’s Flashback and our look back at Ghirardelli’s wholesome Mother Nature line. See you next time! 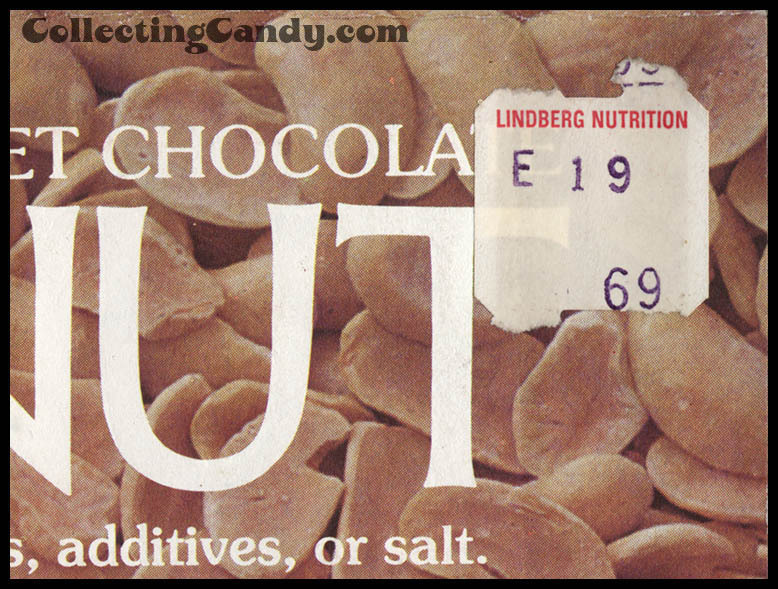 This entry was posted in 1970's, Chocolate and tagged 1970's candy, 1970's chocolate, 1970's wrappers, all-natural, Bay Area, candy collecting, candy collection, candy collector, candy wrapper collection, candy wrapper collector, chocolate, collectible, collecting candy, confectionery, confections, counter-culture, Ghirardelli, organic, packaging, San Francisco, sweets, vintage candy wrapper, wrapper. Bookmark the permalink. 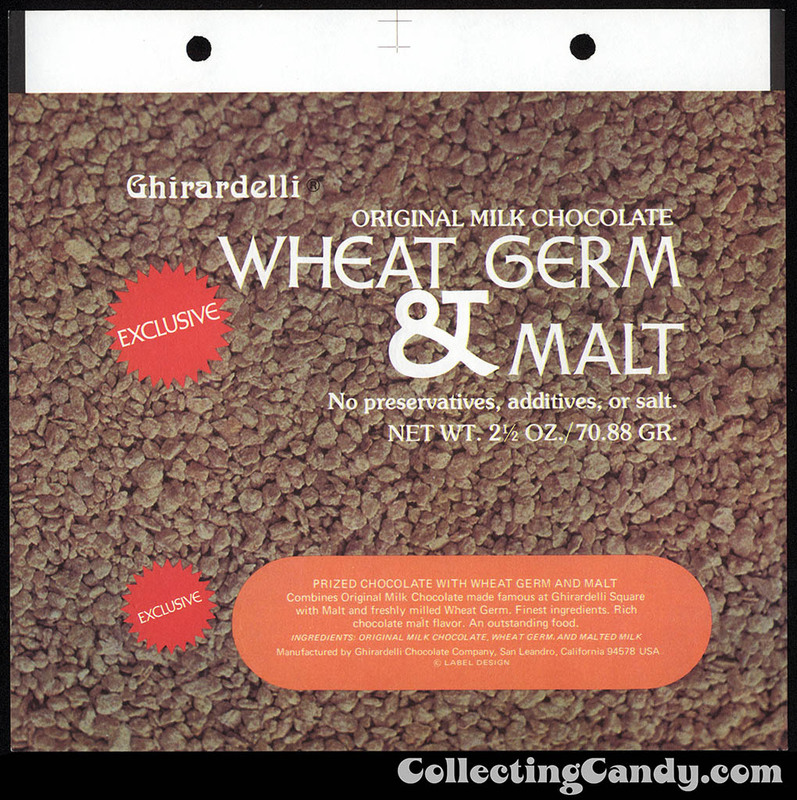 2 Responses to A Groovy 1970’s Flashback: Ghirardelli’s Mother Nature Line!